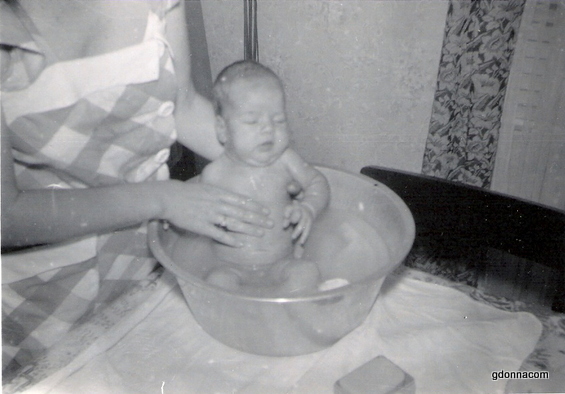 Soap has changed through the years and back when this photo was taken in 1949 my mother would use a bar of soap to do most anything that needed cleaning from bathing my brother in this picture, washing my hair, mopping the floors, washing the dishes and most anything that needed cleaning. For some reason people feel the need for liquid soap and assorted cleaning products. If we want to simplify or reduce chemicals in our home then this post may be something of interest. More people than not use liquid dish soap. It gets sudsy and makes our dishes squeaky clean. But does that come with a toxic effect? A few companies have come out with less toxic dish soap but in our area most of these soaps have to be purchased online. When I say wash dishes with bar soap, I am not talking about synthetic bar soap I am talking about soap. My daughter and I both have an issue with the natural occurring glycerin that is in real soap and it can leave an oily feeling in the water so I have found a way around that and I will show you how I now wash our dishes with bar soap. First I scrape the food off the dishes and fill the sink with very hot water, enough to cover the dishes like pictured above. For this demonstration I am going to use Dr. Bronner's bar soap. There are other soaps that are good too and some of you may make your own soap which is also good. The dishes are soaking and I am rubbing the soap on the wet dish cloth. Remove a dish from the hot soaking water and wash the dish on the other side of the sink with the soapy rag. Now rinse the dish on the other side as well. We have a water saver on our faucet where the water only comes on when your hand pushes the lever. Do the same thing for each piece letting the soap drip to the other sink. This keeps the glycerin from building up in the sink water thus less oily substance. A few times while you are washing your dishes you might want to rub the bar of soap into your rag to freshen the soap. The dishes get very clean this way, we are not using anymore water that we would normally, maybe even less. I will do a study on this too. And water the plants with the rinse water. The soaking water goes down the drain with the food particles. The reason I chose Dr. Bronners is because this baby bar is unscented. It is also Organic as you can see here on the label. I am trying to get my courage up to make some homemade soap, recently one of my blog visitors sent me some very helpful information and I will probably give it a try soon. The Dr. Bronner's is a bit pricey but when we think of our health as well as how many products we can reduce it is probably worth the price. I do advise to use a good soap holder that drains well so the bar does not sit in water and will last longer. *Note, I use dawn dish soap for keeping the pipes clear. I squeeze a bit down the drain a couple of times a week to keep the grease from building up in our pipes. I also put a bit down our bathroom drains occasionally. Many times we almost fear to do things simple because we just don't know what to do or use. This is because the advertising industry wants us to believe we need their products all those products that are filled with chemicals and things we would probably be shocked if we truly knew the truth. I can tell you that you can use plain soap to wash many things. It will take you a bit more effort because using things that "Help it to clean" comes with a price of extra chemicals. Less work, more chemicals, less chemicals, more work. It is up to us to decide. Photo above I am looking into a case at a historic drug store that displays old toiletries. I like to go to museums and places that I can look at old household items and products. My husband and I have quite a collection of old magazines and have searched the library reference rooms for newspaper information. It all depends how far back we look but marketing really took a turn after world war 2. As far as shampoo, it is my understanding from what I have researched that the few shampoos that were on the market before the mid 1940's were not much better than soap. So new soaps emerged, then synthetic soap and the bubbles began. When I look through our 1930's and 1940's magazines and newspapers it becomes obvious that people were being coaxed to change, to try their new and improved synthetic products. By the late 1940s and 1950s as television stations were starting to emerge and households were getting their first televisions advertising took off. Now they could advertise by radio, newspaper, television and magazines. Even cookbooks had advertising. People were being encouraged to become modern and change their furnishings, their products and even which girdles women should wear. All I know is I want something that is not going to make us sick. Something to use that will clean our home without lingering chemicals. The same soap that we bathe with, cleans these floors. To me it is kind of funny how I have come full circle... I started off making a home with very little. No washer, dryer, dishwasher, television and a very limited budget to work with. Then we moved through life gaining all these things. Now we are not wanting all these things and finding our way back to basics once again. I cannot wash all our clothes by hand because I don't have the strength I once did, oh I guess I could somehow manage it, I do hand wash what I can because I don't like the new HE washer we had to get since they could not repair our old washer. Several years ago I went back to hanging our laundry on the clothes line, I only use the dishwasher if I am sick, we got rid of our television cable, and we are so much happier.